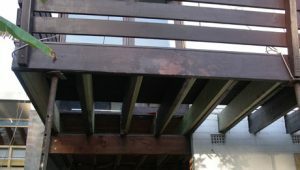 Balcony Renovation – My fear of a falling balcony is laid to rest. The extension is nearing completion. The playroom is taking shape. My phone is running hot. I’m feeling a bit exhausted at the moment. Everything is going so quickly that there’s some new problem to be discussed, dissected and solved every day. I’m constantly on the phone and struggling with piles of emails. Jeff rang me five times yesterday. And I rang him about five times as well. Then I had to keep Frank up to date. Not only that, we also have a site meeting once a week to discuss any problems and to make sure we’ve ordered everything on time. Even though Jeff is project managing, I still need to source various items, such as appliances, bathroom fittings and fixtures, pendant lights, and the bathroom tiles. One of my work colleagues said we should hire a lighting specialist, but I reckon I can handle it. I’m planning on using downlights for general ambience, while the pendant lights will work as our own personal artwork. Best of all, they can be different in each room. I made sure I was here when the electrician came to do all the wiring – it’s like free advice with a specialist. He also walked me through each room and suggested where we should put all the power points. He’s added more than I imagined in the kids’ bedrooms but it makes sense. He pointed out that his kids use desk lights, iPod speakers, laptops and hair driers. One of his daughters even has a string of paper lanterns containing low-wattage LED lights, strung along her ceiling. Ella told me later she thought this was a fantastic idea. I’m sure our future interior designer has already included paper lanterns in her own ‘wish list’! The interior has been going well with internal walls being built, plumbing being completed, and extra insulation being added in the upstairs bedrooms. But it’s the exterior that’s really coming along. 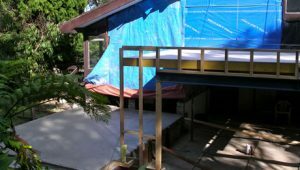 We’ve had the second slab laid at the other end of the house – it lines up with the kitchen extension, and it will become the floor of the playroom. The nice thing is that the ceiling of the playroom will be really high, and it should get beautiful light. We were planning to include a built-in desk in the playroom where the kids could do their homework. Unfortunately, since we’ve taken on a few extra costs, we’re going to have to drop this idea. The walls are built and the cabinetry can be added later. For now, some cheap white shelving will be used to store everything from books to boardgames. 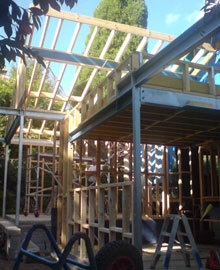 The roof of the playroom was started a few days ago, so it’s really beginning to come together. The new kitchen and playroom look absolutely huge, but as Jeff said, they’ll seem a lot smaller once we add the cabinetry and furniture. And the best news is that our balcony – the one that was on the verge of collapsing – has been fixed. You could hold a party up there now! The thing that I really love about the balcony is that it’s cantilevered – there are no posts. He brought his regular engineer over and we didn’t even have to pay. (I think Jeff was still feeling a bit guilty after the bathroom stuff-up where he didn’t measure the bathroom wall properly). Anyway, the engineer came up with a solution. 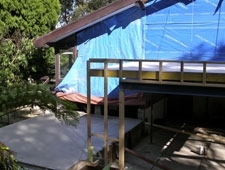 Basically, we had to remove the living room ceiling, which was already sagging, to replace the balcony joists. Now it’s stable and danger free. Yay!